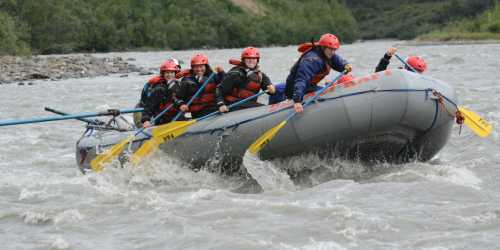 Raft trips at Denali Park, two hours to all day. Knowledgeable guides and comfortable Gore-Tex drysuits provided. Pick paddle or oar rafts, exciting whitewater or scenic mild water. Try it for fun! Adult rate age 12 or older, kids rate age 5 to 11, Paddle rafts offered on the Canyon or McKinley age 15 or older. A 50% deposit is required to hold a reservation. Check out our rafting Menu: McKinley Run: Two hour mild water $94.00 Per Adult, $72.00 kids 5 to 11 Canyon Run: Two hour Whitewater $94.00 per Adult. Healy Express: Combination McKinley and Canyon $135.00 per Adult Full Day: Healy Express plus two hours of mild water with lunch. $192.00 per Adult Four Hour Scenic: Two hours mild water plus McKinley Run with lunch $148.00 per Adult, $128.00 kids 5-11 Please note taxes may apply. Please contact us for more information by e-mail info@denaliraft.com, or phone 1 (888) 683-2234, (907) 683-2234 on the web at www.denaliraft.com.